Light snow falling in Wyandotte County – Welcome to Wyandotte Daily! A trace of snow showed on the ground on Sunday as a light snowfall with little accumulation is expected in Wyandotte County. 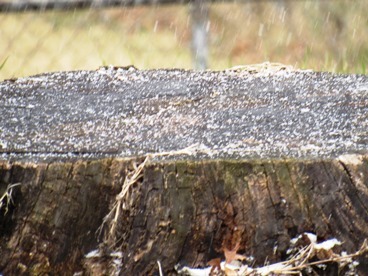 Snow was falling in Wyandotte County about 11 a.m. Sunday, April 8. Snow was moving from the east to the west, and is expected to continue spreading east and south through the day, according to the National Weather Service. Wyandotte County should expect light snow, mixed with some rain today, the weather service said. The temperature was 37 degrees at 11 a.m., according to the weather service, and less than a tenth of an inch of precipitation is expected. Tonight, the chance of showers continues here, mainly before 7 p.m., the weather service said. Tonight’s low will be around 31. Monday, expect a high of 48 with partly sunny skies and a north northwest wind of 7 to 9 mph, the weather service said. Monday night, the low will be around 29, with a north northwest wind of 5 to 9 mph, according to the weather service. The next chance for precipitation will be Thursday night to Friday, when thunderstorms are possible, the weather service said.